Layering is the act of applying several layers of either the same product or different products. A popular example of layering is applying 2 coats of wax, or applying a sealant on top of a wax. Layering can be done with many different products. Layering can have several purposes. It can be done to increase the durability, to make sure you’ve covered every spot, to combine certain optical characteristics etc. Layering can’t just be done with the same product, different products can be layered as well. For example: a sealant on top of a wax, or vice versa. Spit shining is also an act of layering. The same goes for a second coat of sealant. Technically speaking, every product that leaves behind any form of residue can be layered, since you’ll be applying another layer of that residue on top of the previous one. Layering doesn’t limit itself with 2 layers. Some people have layered up to 4 or 5 products. The real-life benefit from this is often very relative. It depends largely on the characteristic you are looking for. Although you can layer different product, you can also layer the same product. A popular example of layering the same product is wax. Many believe that a second coat of wax will help it to perform better. When using a wax, you benefit from a few characteristics that are very common for wax: good filling of light swirls, good gloss, ease of use and low cost. When layering a wax you don’t necessarily get better durability, better sheeting or better beading. Some products don’t show any difference, others do. But layering does help to fill in more of the swirls, which means that 2 coats of wax is much more likely to hide certain imperfections than 1 coat of wax. Sealants are a different story. These product hardly fill any light imperfections, and layering will hardly make any difference. But the chemical make-up of the product does make it easier for the product to adhere to itself. A second layer of sealant will (in the majority of the cases) help the product to show better durability, resistance and sometimes also sheeting and/or beading. Coatings are very similar to sealant. 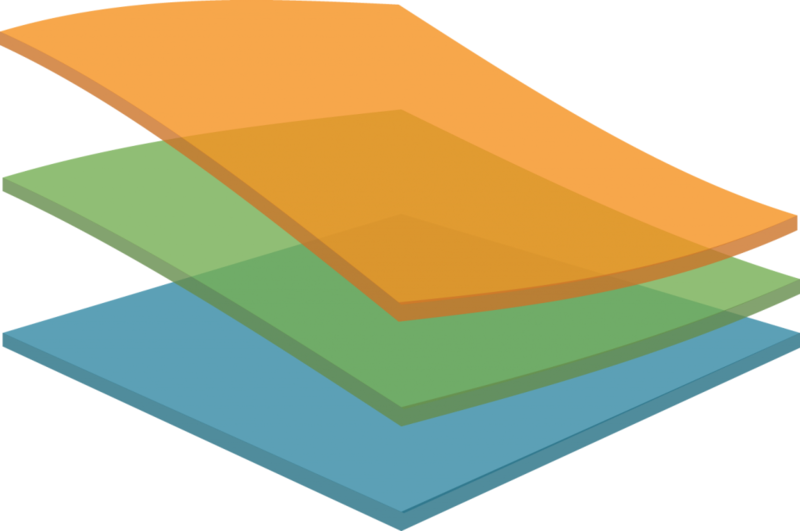 A second or third layer will increase the thickness of the layer and will have a positive effect on the general performance of the product. A very popular example of layering is the combination of wax and sealant. But a coating topped with a sealant can also be done. The users often hope that this will combine all the positive features of the product, without showing the negative features of both products. Although there can be made a very rough “rule of thumb” for this type of layering, it depends greatly on the chemical make-up of the product. For example, a very oily wax (probably a show wax) will prove an unstable surface for the sealant, meaning it will probably affect the durability in a negative way. However, during its lifetime, the sheeting and beading from the sealant can be better than the layer of wax underneath. Applying a glaze first, and then topping it off with a sealant or wax is also a common trick. This is done to hide surface imperfections. Because the glaze is very unstable and has a very short lifespan, the wax is applied to “seal” in the glaze. Hoping it will increase the durability of the glaze and make its effect last longer. Since both wax and glaze are oil based, this combination works fairly good. Sealants are not always oil based (mainly polymer based that don’t have to be oil based) and therefore don’t always react well on the oily layer of glaze. In general, this can be certain effects people are looking for when layering different types of products. A glaze will hide small surface imperfections, making the surface look better without having polished. A wax also has a filling effect, but less then glaze. Glaze won’t offer much durability, but wax will. These 2 products combined will give you hidden surface imperfections with decent durability. A very popular combination that gives you the filling capability of a wax, with the chemical resistance and durability of a sealant. Whether these 2 products affect each other depends largely on the ingredients of both products. The best way to find out is to try it out. In general, this is done to combine the warm glow from a wax with the mirror like shine from a sealant. Although the effects from this are generally the same as applying a wax on top of a sealant (mentioned above), this combination can work better depending on the chemical make-up of both products. The sealant will create a more stable base, which has better durability then the wax. But it will also prevent the wax from filling in the surface imperfections. The result is that you have good durability combined with good beading and a warm glow with a sharp reflection. A sealant is often applied over a coating because a coating is very fragile until it is fully cured. If a coating isn’t fully cured, it can easily suffer from waterspots and surface imperfections. Applying a sealant on top of the coating will help to protect the coating in the first 48 hours, when it is most sensitive. This technique works best if the coating is based on the same ingredients as the coating. A good example of this is Carpro Reload, which is made of very similar components as Carpro CQUK, which is the tough SiO2 coating. There are many, many way how you can layer different products. Such as cutting polish + medium cut polish, glaze and sealants, polish + sealant etc. Using a QD on top of an old layer of wax is also a form of layering. It would be very difficult to describe every possible combination and its effects, but in general it won’t get much better when you have used to many layers. The most important layer is the one on the bottom, which is the foundation for all other layers. A general rule of thumb in the world of detailing is: “don’t overdo it” or “don’t over complicate it”. Detailing is often easier than you would think. Applying 3 or 4 products won’t have any effect anymore. For example, applying a wax, then a sealant and then another wax will give you an unstable top layer with a durability of a few months (at most) with a sealant underneath that might have trouble adhering to the layer of wax underneath. Try to envision layering as building a structure. If the foundation isn’t done properly, the entire structure will suffer from it. Applying 3 or 4 different products won’t make it last longer and the optical different will be too small to even notice. Like any and all forms of ‘protection’ used in the world of detailing, wear and tear will eventually make the protective product useless. Coatings, sealants and wax all need to be replaced eventually. Wax is designed to sacrifice its life in order to protect the contamination from reaching the paintwork. Sealants and coatings try to repel as much as possible. When a product starts to degrade, it won’t just evaporate or disappear. It will create a partially disintegrated and damaged layer that will leave behind, partially covering the layer underneath. If you apply wax on top of a sealant, the layer of wax will deteriorate faster than the layer of sealant. When the layer of wax should be replaced, the layer of sealant is still underneath. It will be covered by a dirty and contaminated layer of wax. If you turn it around, the sealant on top will also slowly deteriorate, but less quick. However, there is chance that the sealant will have more difficulty adhering to the layer of wax. Which might decrease the longevity. Basically you could say that (if the sealant can adhere to the wax underneath) putting a sealant on top would make your protection last longer. However, the chance of your sealant being affected by the wax underneath is fairly big. Sealant on top of a wax: better longevity. The same goes for a wax on top of a coating. The coating will last very long and is extremely tough. The layer of wax you rub on top of it will become dirty and needs to be replaced within a few months. This will result in a worn, dirty and contaminated layer of wax on top of a tough and durable layer of coating. The beading and sheeting will be affected greatly because of the worn layer of wax. Even though the layer of coating underneath is still going strong. There is no safe way to remove the wax without having any effect on the coating underneath. The negatively affected beading and sheeting will give you the impression that the coating didn’t last very long, even though the worn layer of wax is the problem. This problem can also occur when using a sealant that won’t bond properly with the coating underneath. Layering can’t be done an unlimited times. For example, 10 layers of wax won’t make it last for 3 years. And 20 layers of sealant won’t keep your car protected its entire lifetime. There is a maximum amount of layers that can be done. This maximum is reached when an extra layer of product either does not give any different result, or when the total thickness stops increases with an extra layer. This is due to the product no longer adhering to itself and/or the extra layer simply being rubbed off while buffing. The maximum amount of layers differs between product, but in general you can say that applying more than 3 to 4 coats of wax doesn’t make any difference. Sealants often don’t show any difference after applying between 3 to 5 layers. Coatings need time to fully cure, to many layers can prevent it from curing properly. Unless you let each coat cure completely, applying more than 2 coats won’t serve any purpose. When each layer is completely cured, you can layer up to 4 coats with smaller improvements with every coat. The only characteristic that can still improve with the last coat it the overall durability (which (at most) will increase with a few months). Although you can write many rules and have chemists explain every little detail of how detailing works, it is still a principle of trial and error. Detailing can be explained with science, and it makes it easier to understand what will work and what not. But in the end it all comes down to what works for you. What you prefer. Even though there is no science that can support your claims, if that is how you feel that it should be, then that is how you should do it. Detailing is as much an art of science as it’s a labour done with your heart. If you are adamant that 4 layers of wax should be topped off with a glaze, then that is how you should do it. Just try to keep an open mind and try some new stuff every now and then. You might discover a new combination that works even better for you.